Patients suffering from dorsiplantar flexion conditions due to stroke or traumatic brain injury often turn to exercise, muscle strength training or focused stretches to reinstate normal motion. As a part of their rehabilitation AFO (Ankle Foot Orthosis) braces are used in conjunction with these methods. Both the leg and foot segments are adjustable with a simple Philips-head screwdriver to accommodate many different physiologies. The degree to which these can be adjusted allows the PRAFO 650 to be modified and fitted far better than many other AFO braces, resulting in a completely customized feel for each patient. Adjustments can be made to increase or decrease ankle-foot relationship to the calf and the shin- allowing for either a posterior or anterior stop. The ergonomic footplate located under the brace is separate from the adjustable foot segment, allowing the PRAFO brace to increase the inflection arc by up to 10 degrees over time. This inflection arc change can result in a smoother leg swinging motion while walking and running. This rigid shoe-like Polyethylene surface is securely fashioned to allow for safe ambulation and rehabilitation as is without requiring additional special footwear. Because the PRAFO 650 custom-contoured heel bar is made of aluminum it is much more durable than inexpensive braces that merely offer plastic components. This is especially important with heavier patients. The aluminum anti-rotation bar is malleable enough to provide comfort while minimizing unwanted rotation of the hip or leg as the foot is held at a 90 degree angle, minimizing pressure on the medial or lateral malleoli. 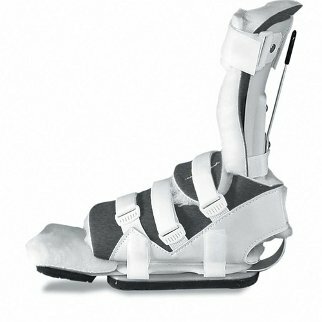 The Kodel liner is the first AFO dorsflexion brace liner of its kind to be completely removable without tools- allowing for an easy transition between use in the hospital and use at home ambulating and doing rehabilitation stretches. Four thick Velcro straps allow the PRAFO 650 to be comfortably secured against the foot and leg during use- prevent loosening during ambulation or rehabilitation. With all of these adjustable features, the PRAFO 650 is more than just positive heel suspension- it allows for infinite measureable adjustments, making it the number one choice amongst doctors and patients alike for plantar flexion contractures and heel ulceration. Nurses also prefer this brace due to the ease of use and increased patient satisfaction that results. In a wide variety of applications it has increased range of motion, and improved overall stability to preserve or restore mobility in patients. The PRAFO 650 may be more expensive than some other AFO braces but the high quality materials inside and superior design are well worth the price difference.